""How Long is Now" is the first studio album from the Texan trio JAMES & BLACK. The record was recorded during two hot weeks in Genova, Italy with producer Luigi Macchiaizzano at Auase studios. The combination of Southern Soul and Hip-hop that the band produces has evolved from their inception in 2011 into a very cohesive and complete sound, live and in the studio. 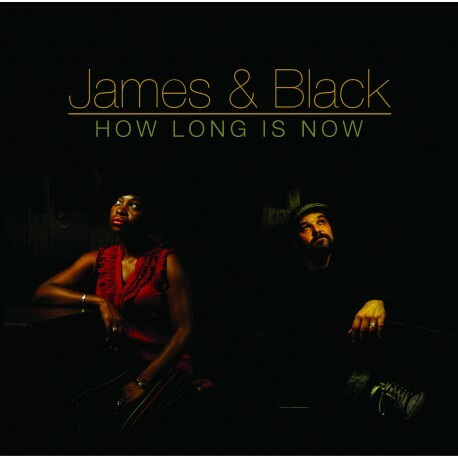 The harmonies and storytelling of Bruce James and Bella Black still remain the focus of the trio. James worked very closely with Macchiaizzano laying the musical foundations providing the fertile dirt for the flowers (songs), allowing the vocals and lyrics to take center stage. DJ Phil Ross adds some very funky and poignant samples and turntable work. The trio was joined on most of the tracks by Genovese guitar man, Paolo Magnani, adding a very soulful texture to the existing grooves. The collaboration with Rocky Marsiano on "The Days" provides a fresh rhythmic texture coming from the Lisbon hip-hop collective Microlandia; the uplifting “Everyday (Walking In Sunshine)” could be a perfect single; Micha den Haring, from Dutch band T-99 plays the gritty slide guitar on Bella Black's moving story of a runaway slave "Whicha Way to Go"… There’s a lot to be discovered in “How Long Is Now”.